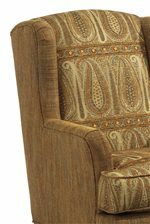 Flared arms, wing back sides, and tapered wood legs offer style to this updated wing chair. The casual style can easily become your favorite chair for a living room, home office, master bedroom, or study. Pair with the coordinating ottoman for a great set to accent any living space. The Bradstreet Wing Chair by Flexsteel at AHFA in the area. Product availability may vary. Contact us for the most current availability on this product. Fabric Options More than 1000 fabrics and leathers – lead time and prices will vary. 020C Chair and Ottoman available two-tone: the inside fabric(pricing fabric) will appear on inback and seat cushion. Outside/body fabric will appear on the rest. The Bradstreet collection offers a more modern take on the classic wing chair and matching ottoman. With the comfortable and stylish set, this chair and ottoman make a great addition to a living room. home office, master bedroom, or other room within your home. 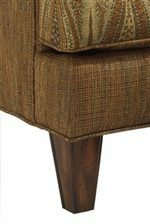 Gently flared arms and carved tapered wood legs add to the updated look of the Bradstreet chair and ottoman group. The Bradstreet collection is a great option if you are looking for Casual furniture in the area. Browse other items in the Bradstreet collection from AHFA in the area.